Also known as the Czar's time tea. A lively delicate cup with sprightly character. Has excellent flavor. 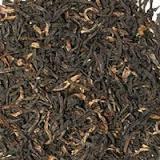 A hint of Lapsang Souchong is added to the blend which makes you relive the mystery of the days of Marco Polo! !